What we build AZEK? TimberTech? Composite? PVC? Vinyl? Cap stock? Should you use AZEK or TimberTech for your new outdoor space? AZEK and TimberTech are both low maintenance synthetic wood brands. We have been using both for years and can attest they are both heavyweights in the composite decking category. You may be surprised to know that, although they are still 2 different brands, the companies actually joined forces in 2014. They have a couple of key similarities and differences which we will enjoy sharing. What is composite or synthetic wood? In order to share the similarities and differences of the brands, we have to back up to talk about the category. Composite or synthetic woods are decking boards, or railing, that provide a number of characteristics making them low maintenance. What that means is you will not have to paint, stain or seal them – ever. They come with warranties, typically of about 25 years. These strong warranties protect against splitting, rotting, and splintering – all the maladies that natural wood suffers as it ages. 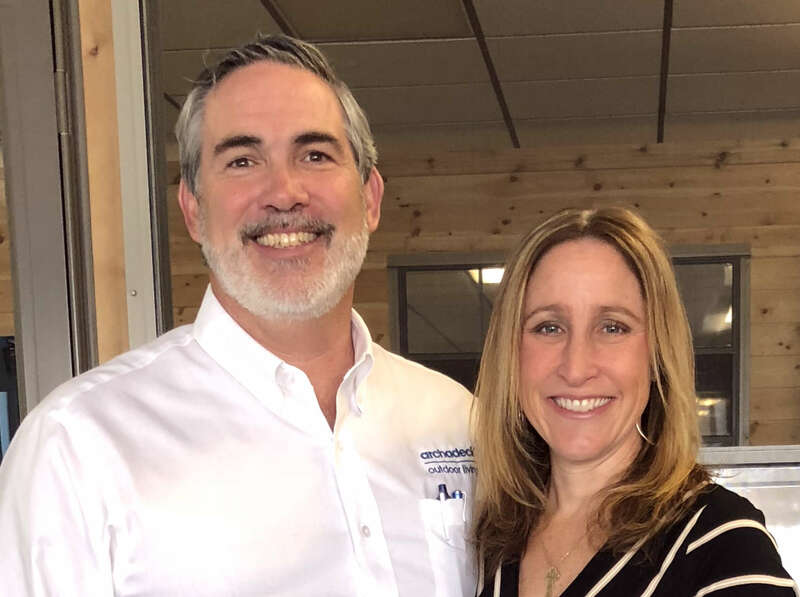 Both TimberTech and AZEK provide a minimum of a 25 year warranty so you can feel confident that your investment and product are warrantied to stand the test of time. What is it exactly? The category that might have previously been described as “fake wood” or “plastic wood” has come a long way. These descriptions stemmed from how composite wood looked when it first came on to the market over 20 years ago. Tremendous design advances have been made to the degree that they likely are rarely now perceived as appearing fake or plastic. 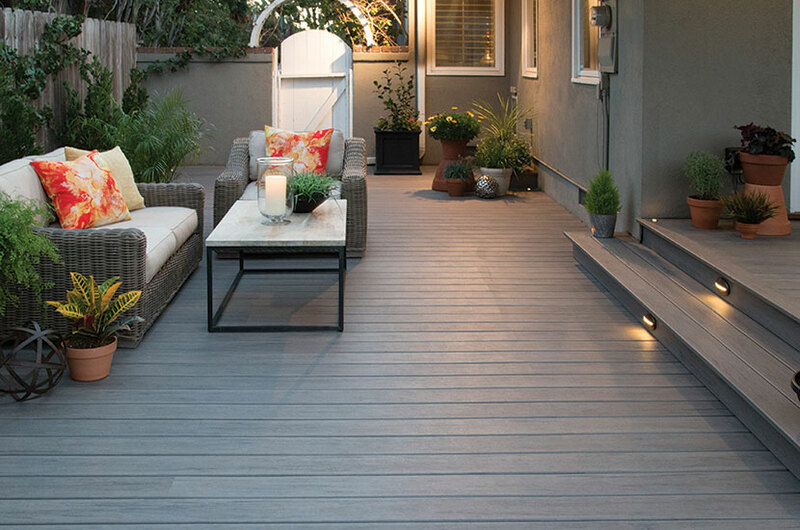 While previously, low maintenance decking was a strictly composite material, that has changed as well. This has warranted the new name of “synthetic” to cover all the new variations in material and the degree of the warranty. Synthetic boards are now broken down into a couple fairly distinct subcategories. These are composite, composite cap stock and PVC. Composite boards are made of a mixture of resin and wood fibers. 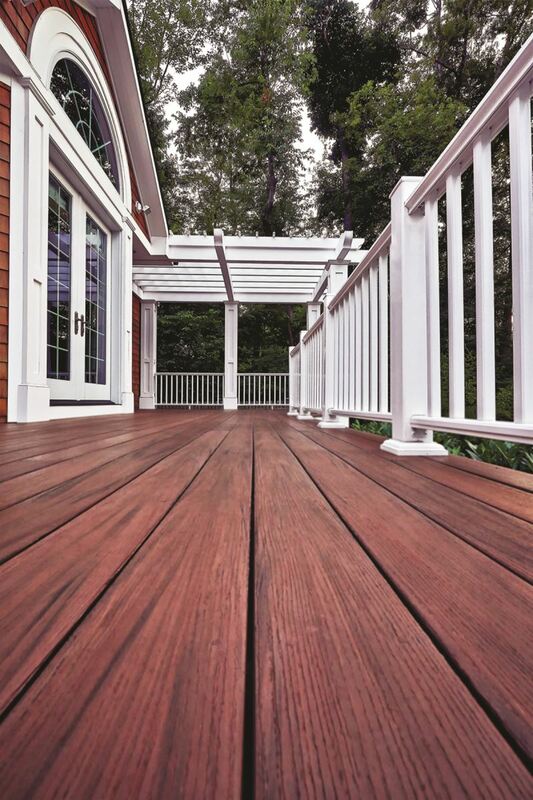 Each of the many companies that make synthetic decking use a different combination of wood and resin. Many years ago, recycled materials were used. Today’s low maintenance boards may use little or no recycled plastic but pay their debt to the environment by lasting 25 years or more. Some synthetic boards are 100% PVC. PVC is the strongest and most durable synthetic material on the market. Since composite (blended) boards include some wood fibers, they are slightly subject to environmental factors that degrade and cause problems with wood. Because the solid PVC boards have no wood fibers, they are the strongest performer in the low-maintenance category. As you can imagine, the 100% PVC boards are a bit more expensive than the boards that contain a mixture of resin and wood fibers. Relatively recently a terrific board has come on the market that capitalizes on the best features of both composite and PVC. Called cap stock, the board is made with a composite core but is capped with PVC. This allows the lower price of a traditional composite core with the higher performance of a PVC exterior. As a result of the additional engineering and with the added cost of the PVC wrap, sometimes the cap stock board pricing is lower than, but closer to PVC pricing. Now back to the initial question. Which brand should you choose? First let us say that there are a number of other synthetic brands on the market but based on our experience working with these boards and both companies, we use these 2 brands almost exclusively. Both brands have similarities in terms of the makeup and performance of their various boards. One exception is that AZEK only utilizes PVC. TimberTech’s line includes both traditional composite boards (see note below) as well as a cap stock line. TimberTech previously had a solid PVC lined called XLM which is now produced by AZEK. 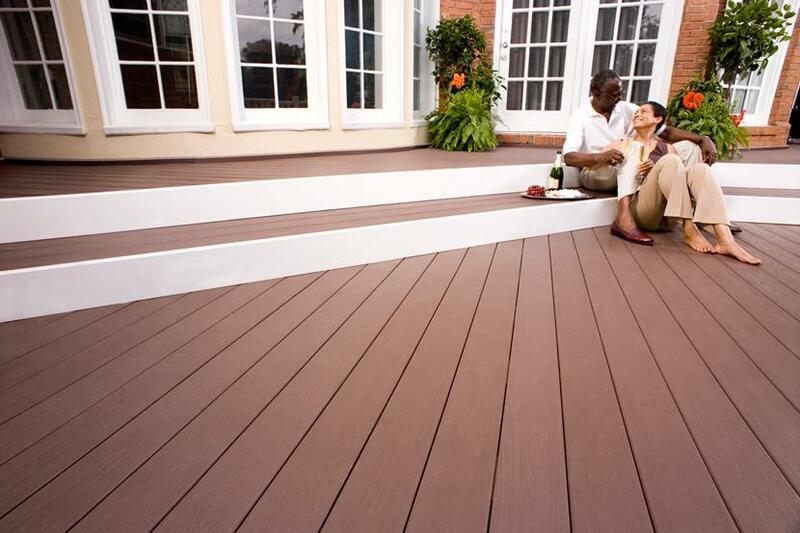 All of the synthetic decking lines produce boards in a variety of colors. In addition to a difference in color pallet, many synthetic companies now provide additional design characteristics giving the boards streaks, grooves and other design details to more closely mimic the look of genuine wood. These vary by board so you will want to take your time evaluating the aesthetic you prefer. AZEK’s line currently has 3 different collections. AZEK’s Vintage Collection is a PVC board capped with a PVC coating providing additional fade and stain resistance. The boards in this collection have a rustic scraped texture and come in rich deep colors such as the medium brown “Cypress”, dark brown “Dark Hickory” and the reddish brown “Mahogany”. 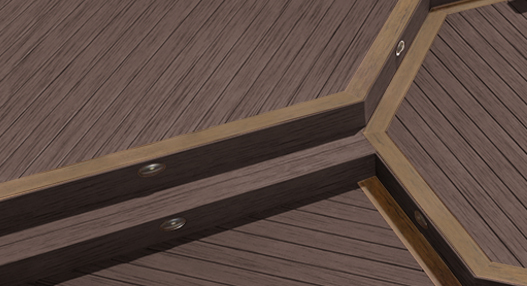 AZEK’s Arbor collection emulates the deep, rich and warm tones of exotic Brazilian hardwoods. Brazilian hardwoods such as Ipe can be a compelling higher end choice but the significant benefit (deep rich color) is soon lost with exposure to the elements requiring a good bit of work to maintain that look. In fact, with genuine exotic hardwoods, you may not be able to maintain the depth of color and clarity of the unique exotic streaking even with substantial efforts to do so. AZEK’s Arbor Collection has marvelous streaking as well as deep rich coloring. This solid PVC collection comes in quite a few colors including Acacia, Mountain Redwood, Brazilian Walnut, Morado, Silver Oak and Hazelwood. Of these, Acacia (deep rich brown) and Morado (rich but slightly lighter brown) are two of the most popular colors in the entire AZEK line. You will want to take a look at both when making your synthetic board selection. AZEK’s solid PVC Harvest Collection provides a softer shade pallet including a chestnut colored “Brownstone”, a more reddish medium brown “Autumn Chestnut”, two gray shades including “Island Oak” and “Slate Gray” and one very deep dark born “Kona”. Kona is also one of the tremendously popular colors in AZEK’s collection. If these options weren’t enough, now let’s take a look at TimberTech’s collections. 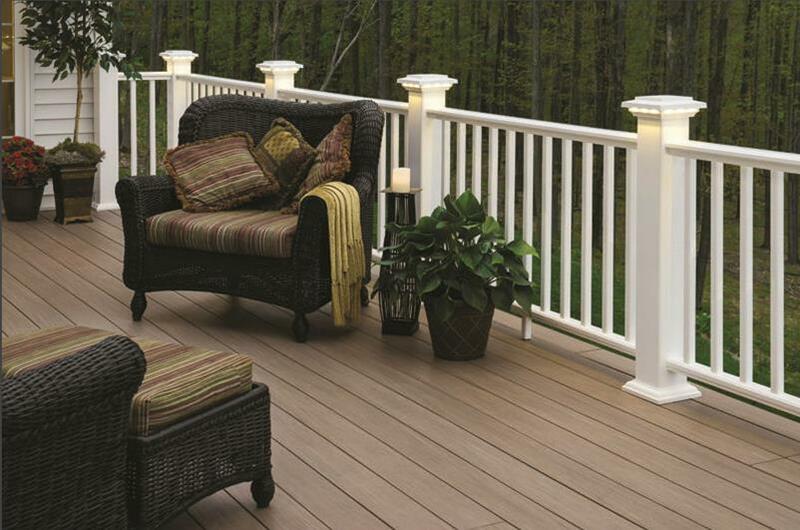 TimberTech’s capped composite line also includes three collections. TimberTech’s Legacy collection is a capped composite that emulates interior hardwoods with a hand scraped texture and a color pallet that resembles interior hardwoods. “Tigerwood” is arguably the most popular color in the line. Tigerwood is a medium brown color. What’s really special with this collection is the board-by-board shade variation that mimics its Brazilian hardwood equivalent. The collection also includes a richer brown “Mocha” and a lighter warm shade “Pecan” that closely resembles that of the authentic pecan it emulates. For a darker gray, the line also includes “Ashwood”. TimberTech’s Tropical collection includes a few shades of brown including “Caribbean Redwood”, “Antique Palm”, and “Antigua Gold”. To offset this collection is a rich dark gray “Amazon Mist”. Finally, is TimberTech’s Terrain Collection. This collection has an authentic graining design that also mimics natural hardwood. The colors are the hues of the natural woods they emulate. These colors include “Brown Oak”, “a darker “Rustic Elm”, and 3 lighter shades “Silver Maple”, “Sandy Birch”, and “Stone Ash”. Should you use AZEK or should you use TimberTech? The best way to make this decision is to do your research. The resource above will give you some guidance into what you would like to explore further. Both companies have tremendous websites where you can see images of each of the shades. Only AZEK’s line includes solid PVC boards. If you want the superior stain and scratch resistance of PVC, you will want to start your search with AZEK. Another great place to start is asking your Archadeck design consultant. 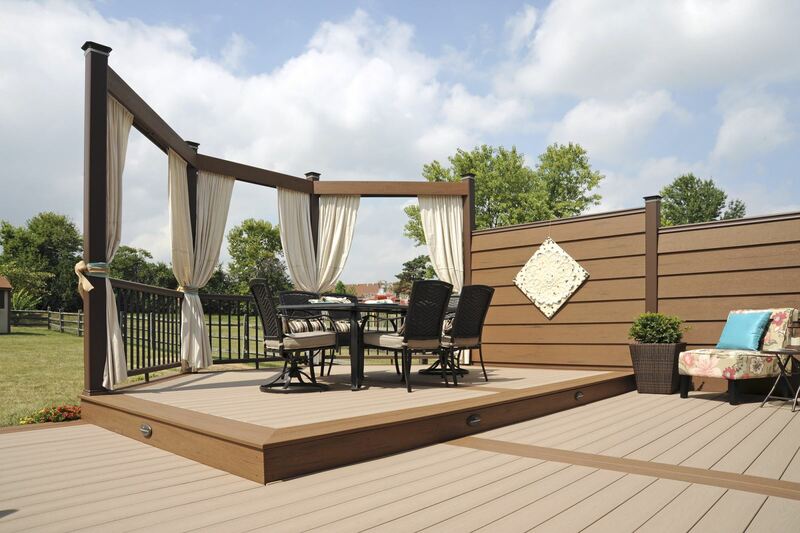 As you can imagine, we’ve built synthetic decks in the Chicago area with numerous different collections and shades. We can guide you as to what’s most popular and show you images of structures we’ve built with the various boards. We also encourage you to visit the homes of some of our references. There is nothing like seeing the materials in use. 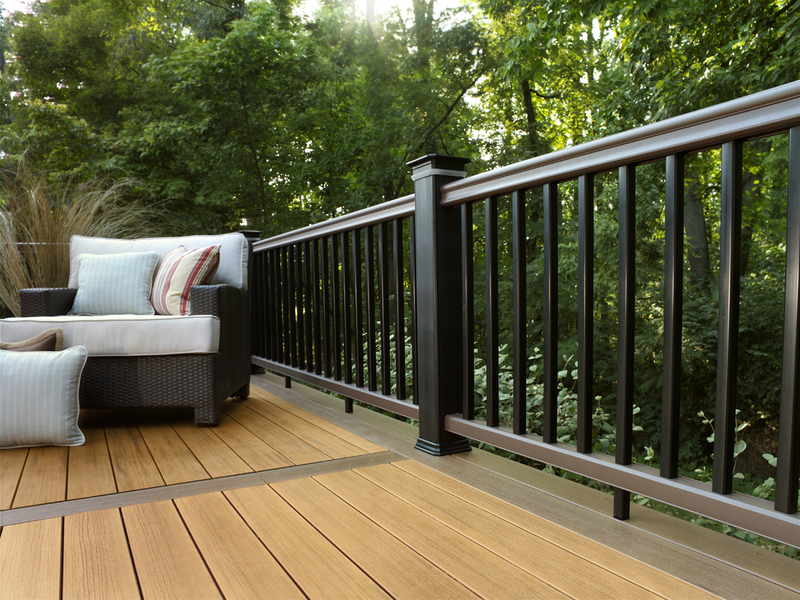 Our goal is to thoughtfully lay out the options, features and benefits to help you make the best decision for your deck.